When you hear—“We have the technology, let’s go”—you might perhaps think the statement came from a stately presidential announcement, like when President John F. Kennedy announced that we’ll now go to the moon (with space technology) or when President George W. Bush announced that we’ll now bomb Baghdad (with shock–and–awe technology). 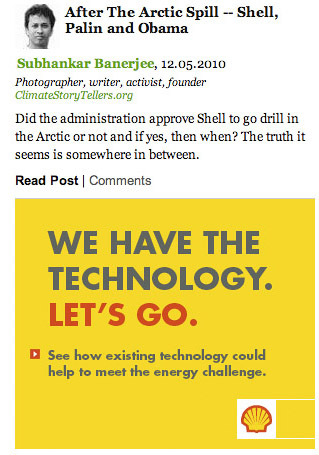 As it happens that statement didn’t come from any presidential address, instead it was printed on a Shell ad placed conveniently right underneath one of my recent posts titled, “After the Arctic Spill—Shell, Palin and Obama” in The Huffington Post. Since the Obama administration is currently considering permitting Shell to drill in the harsh environment of the Beaufort and Chukchi Seas of Arctic Alaska, I’d urge all journalists to raise Nader’s question verbatim as it relates to the ‘technology’ that Shell is talking about. Even though I have a graduate degree in physics and I was once interviewed by the Institute of Physics (Once A Physicist), I’m no expert on offshore Arctic drilling technology. So I’ll cite comments by others who are indeed experts in that area. Last year Alun Anderson published a book titled, After the Ice: Life, Death and Geopolitics in the New Arctic. He was formerly editor–in–chief of New Scientist and before that Washington, DC bureau chief of the science journal Nature. In his book, Anderson quotes directly from a 339–page report that was published in 2008 by the Mineral Management Service (MMS) of the George W. Bush administration, “Floating production systems for the Beaufort Sea, Chukchi Sea, and North Bering Sea are not considered to be technically feasible, even with continuous ice management. No floating production structures could be economically designed to stay on station with multiyear ice loads found in the Beaufort and Chukchi seas.” This was the conclusion of a major report produced by a pro–oil administration just two years ago. Is any journalist asking either the Obama administration or Shell the details of a possibly secret technology that Shell may have developed since? Also note that the BP’s Deepwater Horizon exploratory well was about 5,000 feet (about a mile) below the water surface. Some of Shell’s proposed rigs in the Beaufort and Chukchi seas are beyond that depth and some are lesser than that. President Obama—before you give Shell any permit to drill in our Arctic Seas will you please ask them all of these questions raised in Alun Anderson’s book and many more that I don’t know about and also please ask them “to be specific, give examples, and cite sources for their general assertions?” and whatever answers you get from Shell will you please make them public for all of us to see because I’d like to believe we live in a Democracy? While we’re on the subject of stopping Shell from going to the Arctic, it’s worthwhile to think about our energy future. Are we just a bunch of cranks stopping everything everywhere or are we also going somewhere? It seems we are. If you visit the NEE website you’ll know it is a small organization. They have proved what sound science and community engagement can achieve on a state level even after the national initiatives fail to address climate change and clean energy. Dr. John Fogarty, founder of NEE with colleagues like Mariel Nanasi and many fellow activists and energy experts have made this possible. Hundreds of people across New Mexico from all walks of life—students, farmers, grocers, scientists, engineers, artists (I was one of them), writers, clean energy innovators, unemployed people ... testified at hearings that happened all through this fall. So you see—with technology, a common vision and community participation, it is possible to go into a cleaner future. In his book Alun Anderson does not advocate one way or the other whether we should or shouldn’t drill in the harsh environment of the Arctic Seas. In fact he seems ambivalent about the subject. In some cases he shows excitement about all these futuristic technologies that Russia is employing for Arctic resource explorations, while in other parts of the book he talks about ecological and cultural devastations that these extreme energy projects would bring. We all know that Arctic sea–ice is melting rapidly due to climate change. But here is the crucial point we must address—Arctic Ocean continues to be covered in solid ice for at least nine months of the year. While that still remains the case Arctic sea drilling will always be very destructive, no matter what technology Shell or any other company proclaims that they have. Take for example when Katrina happened, or when the mega Tsunami happened—did our technologies help us from preventing those massive destructions? We know that it didn’t. We must accept the fact that nature still rules and when she wants to be destructive all we can do is step back and watch her wrath unfolds on our TV screens. I want to return to the main–title of Anderson’s book, “After the Ice.” If melting of sea-ice continues apace due to climate change and say in 100 years the Arctic Ocean becomes ice free for 12 months of the year—then and then only I think Shell’s drilling could possibly make sense. So I’m not suggesting that we close the doors on Shell’s Arctic drilling forever. We can certainly reopen the subject perhaps a century from now, “After the Ice,” if we still need oil. Until then wouldn’t it be wise to follow in the lead of states like California, New Mexico and others, and many cities also who are showing the way for—emissions reductions, clean energy and jobs? But let us not get too carried away by technology either—no matter what technology we invent (clean or dirty) our current way of life is unsustainable—there are too many of us consuming too much. It might pay off in the long run if we start learning how to live sustainably. Each year rather unsuccessfully I try to plant a veggie garden in the high desert of New Mexico. The soil is crappy and the wind blows hard, but the sun shines bright. I’ll keep on trying and maybe one day I’ll have a decent crop to share.